Pool Filters are not only critical for the removal of contaminants and particles from pool water, a quality serviceable pool filter is also essential in allowing sanitising and circulation of swimming pool water during operation. Pool functionality, servicing and cleaning are all adversely affected when a filter is dirty, leaking, faulty, insufficiently sized, or in poor condition. An increase in chemicals and adjusters required to maintain balanced pool water along and increased energy usage with longer run-times places further importance on ensuring a pool has a suitably operational filter. Implementing a suitable pool filter type and size is essential to ensure filtering capabilities and efficiency of operation can be achieved. A pool’s size or capacity will dictate the type (i.e. Cartridge Filter or Media Filter) and the size of pool filters required, although many factors must be considered to ensure optimum performance. The bather load or amount of swimmers expected to use a pool will greatly affect the workload and amount of filtering that is required and so in high usage pools or shared pools, a filter with increased capability and capacity along with increased regularity of maintenance is most often required. The functional and building design of a pool, including any features, in-floor cleaning systems and auto cleaning units, along with size and positioning of pool return plumbing and space available for installation, will all determine which filter is most suitable. Compatibility to existing operating equipment such as pool pumps and sanitising units (i.e. salt water chlorinators or ionizers) will be key for performance and warranties for all equipment. The manufacturer specifications and recommendations must always be adhered to, including maximum and minimum flow rates, working pressures and filtration velocity. 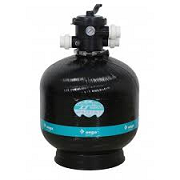 Purchase a quality brand pool filter and have it installed by a pool professional. Currently, our best selling models of pool filters (sand & glass media) on the Sunshine Coast, are included in these pictured below. Regular servicing and cleaning of pool filters is essential in keeping a healthy pool and delivering longevity of operating equipment. Under-performing filters will not only turn a pool green but can cause further damage or harm to other operating equipment, plumbing and pool surfaces. Regular pool servicing should include the inspection of all filtration equipment, including cleaning and removal of contaminants filtered out of the pool water. Cartridge Filters require regular removal from tanks for cleaning and have reduced filtering performance and functions to that of a quality media filter, which provide for more convenient cleaning of filter media via backwash and rinse functions. When it comes time to replace filter media and cartridges, full replacement of items should be costed for viability. It may be more economical in the long term, particularly given the insurances new equipment will provide, to undergo a complete filter replacement or upgrade. Silica Sand or Glass Media are the only two worthwhile options in pool filter media choice. Glass Media is a little more expensive per kilogram than Silica Sand though it boasts the ability to filter out smaller particles and has a lifetime expectancy of more than double that of sand. Glass Media will never need replacing in domestic applications and will outlast most other filter components. Backwash and Rinse Cycle Times can also be reduced with Glass Media present and this amounts to saving in water usage. If you would like any advice on pool filters please give me a call.